Fishermen have plenty on their minds — whether or not they have a lot in their nets. During a bad season, they worry about the lack of fish. When fish are plentiful, watermen face depressed prices. North Carolina commercial fishermen and fish houses have to struggle to get the catch to the market and fetch a good price. However, at a time when watermen and the fishing industry are disappearing, the demand for local catch is rising. Fishermen, fish houses, retailers, restaurants and seafood enthusiasts have made consumers — at the coast and inland — aware of the health and environmental benefits of local catch. But this demand and awareness may not help the fishermen at the coast. The commercial fishing industry in North Carolina is at a critical juncture. Hardy Plyler, who at 64 has spent most of his life fishing or operating fish houses, has noticed that the commercial fishing industry in North Carolina is slowly disappearing. “There are major problems in the supply chain and the commercial fishing industry is experiencing one of its worst times ever,” Plyler says. He runs the Ocracoke Seafood Company, a fish house operated by the nonprofit Ocracoke Working Watermen’s Association since 2005. So what is going wrong? What ails the fishermen, fish houses and processors in North Carolina, bringing their numbers to a historic low? The result is a report, titled A Supply Chain Analysis Of North Carolina’s Commercial Fishing Industry, available at go.ncsu.edu/seafood_supply_chain. Kros, who teaches at ECU’s College of Business, lists three reasons why North Carolina’s commercial fishing industry is struggling. “At the outset, it became clear that the industry overall is in trouble. Regulations are hurting it. The workforce is aging and is not being replaced. And seafood imports have been devastating for the industry,” says Kros, who led the study. The supply chain for seafood in North Carolina starts with the watermen, who are linked with a fish house or seafood processor. The buyer or processor delivers the seafood to retailers and restaurants, who then take the fish to its final stop — the consumer. Older fishermen are leaving the industry faster than younger watermen are joining their ranks. Photo by Roger Winstead. Over the past few decades, globalization has made it possible for lower-cost imported seafood to enter the domestic markets, forcing the domestic fisheries industry to compete in pricing. Local fishermen and processors started losing market share and revenue. “Most of the players in North Carolina are small players who depend on small fishermen and they are completely overwhelmed by the supply of imported fish in the market,” Kros notes. A separate, Sea Grant-funded study also found that the number of seafood processors declined by 36 percent between 2000 and 2011. Furthermore, the economic value of North Carolina’s catch has declined from about $109 million in 1995 to $79 million in 2013. Bill Rice, owner of Fishtowne Seafood Center in Beaufort, notes that the major problems in the state’s fisheries supply are at the start of the chain. “We do not have a lot of fishermen left. Federal and state regulations also hinder the supply of fish,” he says. Others echo this sentiment. In the report, fishermen say that regulations restrict where, when, how and what they can harvest. “I never know how much I am going to catch, how long I’ll be allowed to catch it, or how much I will be paid for after I catch it. That’s a hard way to run a business,” a commercial fisherman is quoted in the report. This is the first kink in the supply chain, Nash notes. “The seafood industry is unpredictable. Unpredictability is not good for business,” he says. Changing weather is a factor. But fishermen say that environmental conditions — such as agricultural runoff that affects water quality — add to the volatility. Plyler says that current regulations need to keep up with seasonal and yearly changes. However, this presents many challenges. Once the fish comes in, it needs to go somewhere. Instead of traveling westward into the state, North Carolina’s fish are more likely to go north to Maryland, New York and Boston. Once North Carolina’s seafood leaves the state, it loses its identity. Photo by Roger Winstead. The state sends most of its catch north for two reasons. “First, distribution routes that go from south to north are well established. The routes from east to west tend to get fragmented, which makes it unlikely for large volumes to travel inland,” Kros says. Currently getting seafood inland from the coast depends on the efforts of small businesses and community fisheries. They take small amounts of products to Raleigh, Greensboro and Charlotte markets. Rice has someone to carry his fish to his customers in the Triangle. “It serves me well but it has limited reach — but then I do not have supplies that will let me expand further,” he adds. Second, there is a lack of freezing facilities, which could help retain inventory in the state. Most local fish houses have just ice as a means of preservation. More sophisticated refrigeration techniques, such as flash freezing and refrigerated trucks, are needed to maintain and transport seafood inventory. Building such infrastructure is an expensive venture for small fish houses. Fish houses, unable to keep their catch fresh for long, often turn to wholesalers and wholesale consortiums in the northern U.S. The report notes that there are no such consortiums in North Carolina that accept large volumes of iced, unfrozen seafood for distribution to urban markets. Smaller dealers are unable to handle large volumes of seafood and lack the sales force, expertise or money necessary to develop big accounts to build inland markets in the state, Kros adds. Standing between the end consumer and the fish houses are the retailers. While several fish houses have their own retail stores, most of them are concentrated in the coastal areas. Community supported fisheries are a popular method of selling to inland residents. Customers pay in advance to receive a weekly share of seafood, based on seasonal availability. 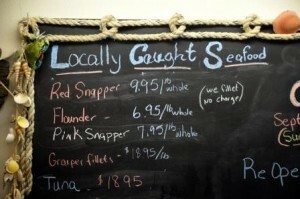 “The movement for local catch has increased the demand for local seafood. We not only have customers in the coastal areas, but see demand from inland, like Raleigh and the Triangle area,” Rice says. Such models work for fishermen and fish houses because they attract consumers who understand the unpredictability and seasonality of local catch, Kros explains. In addition, consumers are willing to pay more to ensure their fish are locally caught. This fish house at Holden Beach offers a variety of seafood in different forms — whole, dressed and filleted — to its customers. Photo by Roger Winstead. “People like to eat local food that is harvested through ways that are sustainable. If they have the option of moving away from imports, they would,” says Lin Peterson, co-owner of Locals Seafood. His business delivers fresh seafood several times a week to restaurants and consumers in the Triangle. Another alternative is for fishermen or fish houses to partner with retail stores, both big and small. The report surveyed 110 retailers as part of its analysis, of which 53 percent were small retailers, such as independent grocers and sole proprietorships. The rest included big chains such as Food Lion, Harris Teeter, Kroger, Lowes Foods, Piggly Wiggly, Trader Joe’s and Whole Foods. For small grocers, the availability of seafood decreased west of I-95. For bigger chains, seafood supply seemed to be consistent, but imported frozen seafood had a larger presence farther from the coasts. At the time of the study, these retailers had a limited, or nonexistent, offering of North Carolina seafood. The report notes that purveyors at some grocery stores had little knowledge about the origin of seafood they were offering consumers. “This is problematic because even if well-informed consumers inquire about the origin of the product, local or imported, the frontline seafood workers are in large part unable to answer the question,” the report observes. “We sometimes know that some of the food is local catch or at least is not imported. We do not get many inquiries, but when we do, we have to rely on what is written on the packets,” notes Sam, a worker at a Food Lion in Raleigh. But some chains do focus on local seafood. Last year, a Whole Foods store in Raleigh hosted a dinner with Sea Grant to feature local species. “As consumers, we all play a large role in the health and quality of our waters and the bounty it provides,” explains Jenn Dixon, the store’s team leader. The Rural Center report* identifies Harris Teeter as a supermarket chain that is engaged with North Carolina’s seafood industry. They have a dedicated area in the fresh fish section and include local seafood promotions in weekly advertisements. “The model of partnership between the big retail chains and local catch groups might be something that should be studied and replicated,” Nash says. However, “this might not work if the processing units, and freezing and storage facilities are not put in place,” he adds. Kros notes that without consistent supply, competing with imports that are available year round will continue to be a challenge. 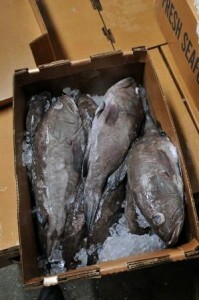 “Imports flood the markets and commercial fishermen just don’t catch that kind of fish. It is difficult for us to compete with the big retail chains that require large and consistent supply,” Ocracoke Seafood’s Plyler explains. The report also notes that prices of local seafood inland were similar to those on the coast. Market conditions, not shipping costs, were the main influence on seafood prices. The problems, however, are not enough to capsize North Carolina’s commercial seafood industry. “There is a great entrepreneurial spirit among the fishermen and processors in North Carolina. They are finding ways to make their products more unique and are also trying to compete in price,” Kros says. He adds that small businesses that offer community supported fisheries initiatives are carving out a niche for local catch. Fish houses also are trying to enhance the value of their products to increase sales. To do so, they are adding some small processing steps to their catch, such as peeling and deveining shrimp, cutting fish fillets, and smoking seafood. Such products represent limited, high-priced sales rather than high-volume transactions. In the fish house inventory conducted by Sea Grant in 2012, nearly 29 percent of dealers surveyed were manufacturing or marketing items. The sellers could increase the price of these items through the use of ingredients or methods that satisfied consumer expectations of enhanced nutrition, taste appeal or ease of preparation. With new products — frozen crab cakes, deveined shrimp, ready-to-eat salads and spreads, stuffed fillets or shrimp, smoked fish, frozen oysters, and bacon-wrapped scallops — fish houses offer customers value-added food options. In an effort to establish their brand, some even are going beyond traditional fish house offerings and distributing recipes. Many restaurant owners and bulk buyers also seek — and are willing to pay a little extra for — semiprocessed products. For example, “chefs prefer to purchase shrimp that is peeled and deveined and uniformly sized,” the report notes. 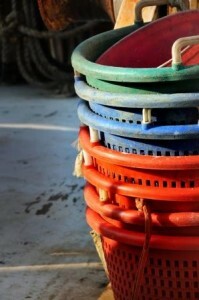 Increasingly, fishermen and small processors are investing in the equipment to do this. The supply-chain report cites the example of a Dare County processor who constructed a cutting room to fillet finfish for restaurant chefs in the county. But the local seafood industry also needs advice and guidance from other quarters. The report names Eastern Carolina Organics, an organization that offers dedicated sales and distribution services to agricultural farmers, as an example. The local catch groups and community supported fisheries are first steps in the process. Catch groups have been effective in branding local seafood and have been instrumental in drawing restaurants and consumers toward locally caught seafood. “We have benefitted a lot from the local catch groups. People know about us through them and our brand is enhanced,” Rice says. The report further suggests developing at least one modern processing unit and cold-storage aggregation facility on the coast with the capacity to freeze large volumes of seasonal seafood. “This would permit the distribution of local products to better fit consumer demand and increase industry profits,” the report states. A centralized distribution center farther inland also is recommended as a way to aggregate commodities sourced from coastal regions. Its presence would allow local seafood to flow across the state in a more established and efficient manner, the report adds. The researchers recommend that processors and retailers collaborate and set up common carrier and refrigeration services. This would bring down their costs and increase supply to inland areas with high demand. * ERRATA: Story was updated Jan. 30, 2015, to clarify that the research was commissioned and funded by the North Carolina Rural Economic Development Center, and that the report is a product of the Rural Center.